Hence, it provides what would appear to be an ideal locale to investigate the relationship between fluoride level in drinking water and IQ of children. 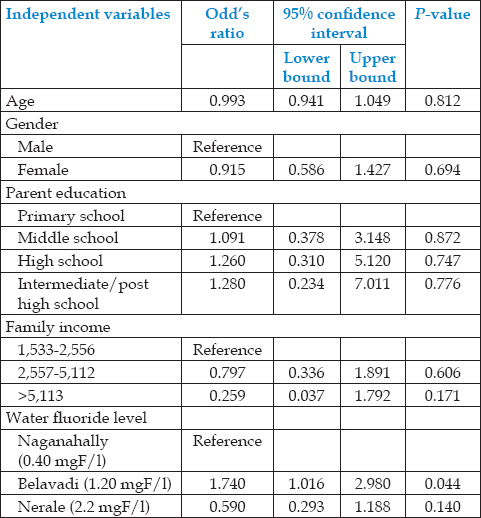 Since a review of scientific literature indicated a scarcity of such studies in Mysore district, the current study was conducted to assess the IQ of school going children aged 10-12 years in villages of Mysore district with different fluoride levels. Information regarding the fluoride levels in different places of Mysore district was obtained from Rajiv Gandhi National Rural Drinking Water Program (RGNRDWP) which showed low (<0.5 ppm), optimum (0.5-1.5 ppm), and high (>1.5 ppm) fluoride areas. Based on these different levels of fluoride, three village panchayaths were randomly selected; namely, Nerale (2.0 ppm) which belonged to high fluoride area, Belavadi (1.2 ppm) which belonged to optimum fluoride area, and Naganahally (0.40 ppm) which belonged to low fluoride area. From each panchayath one school was selected for the study purpose. Each school was considered as a cluster and all school children in the age group of 10-12 years who fulfilled the eligibility criteria were included in the study. Four hundred and five participants aged 10-12 years living in three villages in Mysore district were recruited for this cross-sectional study. The three selected rural areas were similar in their general demographic and geographic characteristics with the inhabitants having a comparable level of socioeconomic status and similar occupations. All participants were long-life residents of the villages under study, with their mothers having lived in the area during their pregnancies. The exclusion criteria included a history of genetic disease, systemic disorders, or brain trauma in the family. A written informed consent was obtained from the parents of all subjects after explaining the nature and aim of the study. A detailed questionnaire was completed including information about child's demographic status, parent's education, and family income. The dental examinations were carried out by the investigator itself according to the World Health Organization (WHO)-recommended Dean's index. Prior to conducting the study, the investigator was trained in the Department of Public Health Dentistry, JSS Dental College and Hospital, Mysore under the supervision of an expert. Calibration was done on 20 subjects who were examined twice using diagnostic criteria on successive days, and then the results were compared to know the diagnostic variability. Agreement for assessment was 87%. The intellectual ability of each child was calculated using Raven's Coloured Progressive Matrices (RCPM). The models were presented in the form of matrices. In each test item, the child was asked to identify the missing part that completes the model. The test was administrated in a convenient school classroom under the supervision of a trained psychologist following the procedures laid down in the manual of Raven's Progressive Matrices. The average time taken to complete the test was 30 min. The test comprised of 36 problems, beginning with easy problems and ending with difficult ones. Each question contained a matrix of geometric design with six alternatives for one removed cell. Only one of the options fitted correctly. The children's IQ scores were divided according to the Current Wechsler classification in six groups: Superior (120-129), high average (110-119), average (90-109), low average (80-89), border line (70-79), and extremely low (<70). All analyses were performed by Statistical Package for Social Sciences (SPSS) version 17.0 for Windows. The data were subjected to analysis of variance (ANOVA), post-hoc test, and binary logistic regression. The significance level was fixed at 0.05. Four hundred and five 10-12-year-old children took part in this study.Dental examination revealed that 74% children in high-fluoride group demonstrated mild to severe fluorosis. In comparison, only 20% of the subjects in the normal and 8% subjects in low fluoride groups showed very mild to severe fluorosis and the remaining were unaffected [Table 1]. An increase in water fluoride content above the standard level was associated with the incidence of more severe dental fluorosis (P < 0.001). IQ evaluation results from the three groups are shown in [Table 2]. Although IQ scores for children with normal and low fluoride content were significantly higher than high fluoride level (P < 0.01), there was no statistically significant difference between the IQ of children residing in normal and low fluoridated areas (P > 0.05). Furthermore, we did not observe any significant difference between the scores of girls and boys in any of the groups examined (P > 0.05). IQ scores of children living in areas with various water fluoride content (normal, medium, and high) have been demonstrated in [Table 3], exhibiting that more children residing in the normal and low fluoride area showed normal IQ levels. Binary regression model was used to adjust the relationship between IQ score and the other potential confounders in the study. The dependent variable was IQ score. The independent variables included were age, gender, parental education, family income, and water fluoride level. After adjusting the variables, it was found that the IQ scores were increasing as the education level of parent increases. However, this association was not found to be significant. Significant association was found between the IQ score and water fluoride level when the variables like age, gender, parental education, and family income were controlled [Table 4]. Our findings showed that the prevalence and severity of dental fluorosis was greater among children with high water fluoride content. As a probable result of "the halo effect", we found a 20% prevalence of fluorosis in children living in the village with a standard fluoride level, which was in accordance with WHO guidelines explaining that at an optimal fluoride level (1 ppm), about 20% of the population demonstrate fluorosis. , However, in village with a higher than standard fluoride level, 83% children demonstrated dental fluorosis with a severity index of very mild to severe. As it is well accepted, the neurobehavioral development may be influenced by many genetical, socioeconomical, and geographical factors. Thus, we have recruited our samples from a homogenous population in Mysore district, diminishing the effect of some environmental and inherited factors, yet it is obvious that complete exclusion of such factors is impossible. In the present study, the education level of the parent appears to play a definite role. Yongxiang et al., discovered that the IQs of children born into an "employed" household was higher than those born into a farming household, and that the IQ levels of the children increased along with the education level of their parents. This indicates that a positive educational influence from the family is a benefit to child's intellectual development. Therefore, strict uniformity requirements must be enforced when selecting an area for study, determining the test subjects, etc. The present study paid special attention to this aspect; and the occupation and education levels were basically matched in all the three villages. In a previous study, the urinary fluoride level was implemented as the basic indicator for the child's fluoride exposure. However, since urinary fluoride excretion may vary from one subject to the other or even in the same person, and because drinking water was typically the greatest single contributor to daily fluoride intake in this area; we have evaluated the effect of different amounts of fluoride in drinking water. In the present study, the effect of fluoride concentration on the child's IQ was assessed; however, it is possible that other trace elements in drinking water may have some neurological side effects. Thus, further studies are required to investigate the effect of other environmental or geological contaminants. Srikanth, in 2009, pointed out that in India about 62 million people are suffering from various levels of fluorosis, of which 6 million are children below the age of 14 years.It should not come as a surprise that excess fluoride is one of the three major hurdles according to tenth 5-year plan in India. Although the biomechanism of fluoride in reducing IQ is not clear;but on the basis of the data from this study, it is evident that excess fluoride in drinking water has neurological toxic effects. Therefore, a close monitoring of fluoride levels in local watersupplies from areas with endemic fluorosis and implementing public health measures to reduce the fluoride exposure levels in high fluoridated regions seem necessary. The IQ scores of children living in areas with above the standard water fluoride levels were lower compared to children living in normal and low fluoride level regions. In the high fluoride village, the proportion of children with IQ below 90, that is, below average IQ was larger compared to normal and low fluoride village. Age, gender, parent's educational level, and family income had no significant association with the IQ scores. Iyer K, Panchmal GS, Shenoy RP. Defluoridation techniques implemented by the government of Karnataka, India- the current situation. Community Dent Health 2013;30:127-8. Kaufman JM. Water fluoridation: A review of recent research and actions. J Am Physicians Surg 2005;10:38-44. Poureslami HR, Horri A, Garrusi B. A comparative study of the IQ of children age 7-9 in a high and a low fluoride water city in Iran. Fluoride 2011;44:163-7. Government of Karnataka (2006): Baseline Report of Sachetana Drinking Water Project, Karnataka, India: Rural Development and Panchayath Raj, BAIF Institute for Rural Development. Available from: http://www.indianwaterportal.org. [Last accessed on 2012 Sep 12]. Report of Rajiv Gandhi National Rural Drinking Water Program; Ministry of Drinking water and Sanitation; Government of India. Available from: http://www.indiawater.gov.in]. [Last accessed on 2012 Oct 09]. Fawell J, Bailey K, Chilton J, Dahi E, Fewtrell L, Magara Y. Fluoride in drinking water; 1 st ed. London: WHO; 2006. p. 1-95. Raven J, Raven JC, Court JH; Manual for Raven′s Progressive Matrices and Vocabulary Scales. Section 2: The Colored Progressive Matrices. Oxford, England: Oxford Psychologists Press/San Antonio, TX: The Psychological Corporation.Edition-1998. Xiang Q, Liang Y, Chen L, Wang C, Chen B, Chen X, Zhou M. Effect of fluoride in drinking water on children′s intelligence. Fluoride 2003;36:84-94. Vani LM, Reddy KP. Effects of fluoride accumulation on some enzymes of brain and gastrocnemius muscle of mice. Fluoride 2000;33:17-26. Chirumari K, Reddy PK. Dose-dependent effects of fluoride on neurochemical milieu in the hippocampus and neocortex of rat brain. Fluoride 2007;40:101-10. Ge Y, Ning H, Wang S, Wang J. Effects of high fluoride and low iodine on brain histopathology in offspring rats. Fluoride 2005;38:127-32. Mullenix PJ, Denbesten PK, Shunior A, Kernan WJ. Neurotoxicity of sodium fluoride in rats. Neurotoxicol Teratol 1995;17:169-77. Meenkashi, Garg VK, Kavita, Renuka, Malik A. Groundwater quality in some villages of Haryana, India: Focus on fluoride and fluorosis. J Hazard Mater 2004;106:55-60. Niu R, Sun Z, Cheng Z, Liu H, Chen H, Wang J. Effects of fluoride and lead on n-methyl- d-aspartat receptor 1 expression in the hypocampus of offspring rat pups. Fluoride 2008;41:101-10. Blaylock RL. Excitotoxicity: A possible central mechanism in fluoride neurotoxicity. Fluoride 2004;37:301-14. McDonald RE, Avery DR, Stookey GK. Dental caries in the child and adolescent. In: McDonald RE, Avery DR, Dean JA, editors. Dentistry for the child and adolescent. 9 th ed. Philadelphia: CV Mosby Co; 2011. p. 77-204. Li Y, Jing X, Chen D, Lin L, Wang Z. Effects of endemic fluoride poisoning on the intellectual development of children in BAOTOU. Fluoride 2008;41:161-4. Yongxiang C, Fanlin H, Zhenlong Z, Huiquin Z, Xisheng J, Suocheng Z, et al. Research on the intellectual development of children in high fluoride areas. Chin J Cont Endem Dis 1991;6 Suppl:99-100. Wang SX, Wang ZH, Chang XT, Li J, Sang ZP, Zhang XD, et al. Arsenic and fluoride exposure in drinking water: Children′s IQ and growth in Shanyin county, Shanxi province, China. Environ Health Perspect 2007;115:643-7. Srikanth R. Challenges of sustainable water quality management in rural India. Curr Sci 2009;97:317-25.